Żebbuġ Local Council, Gozo 2018; 624 p.
Żebbuġ of Gozo is a monumental work by Prof. Horatio Vella that covers the history of the village of Żebbuġ in the northwest of Gozo from the pre-historic era to the present day and age. It is different from the other works by the classical scholar; this time we have in our hands a publication that is the result of a love-affair, a love-affair that began about a decade ago when the author and his family bought a flat at the end of Għajn Mhelhel Street, the street that leads to Xwejni, Qbajjar and Marsalforn. This does not render the publication any less academic; the author has been working on the book for more than a decade and he is presenting us with a fait-accompli; the book is the ultimate authority on the subject and brings together a great amount of information of geological, archaeological, geographical, linguistic (related to toponymy), demographic, ecclesiastical, historical, literary, cultural and logistical importance about the locality of Żebbuġ. An encyclopaedia of all that is related to the northern-most village of Gozo would be the best term to apply to the present publication since there is hardly anything related to the village that is not to be found in the book. As a classical scholar, Prof. Vella is in the best of positions to provide us with a detailed translation of all the epigraphic slabs that are to be found in the locality of Żebbuġ. In fact, one of the chapters of the book is dedicated to all the inscriptions one can find in Żebbuġ. The majority of them are in Latin since they are of ecclesiastical provenance but others are in our native Maltese language. The author provides us with the original together with an adjacent translation into English making it easier for the reader to understand. Genealogy is a science that has attracted more interest of late especially among those Maltese and Gozitans emigrants who return to Gozo to settle and stay. Parish priests may receive the odd e-mail asking for family information that is then used by the caller to organise his or her own family tree. Prof. Vella worked on hundreds of genealogical trees. 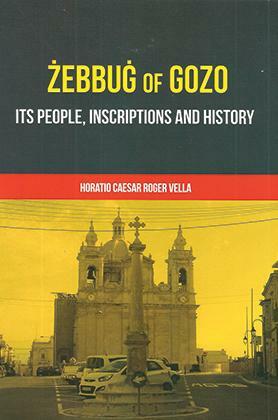 Being a descendant of the Manueli family – a family with close connections to Gozo and Żebbuġ – Vella must have felt a personal interest in the subject as he drew the various genealogies that run from 1405 up to 1935. Through these family trees, he manages to show the familial connections between many priests who stemmed from Żebbuġ throughout the ages as well as the various familiar ties existing between families of the village itself. With the intricate details of the hundreds of individuals, both members of the clergy as well as lay members of the community, Prof. Vella has created a history of the people. His publication is not a guide-book for the clergy or elite of the village; on the other hand, it is very much a history of the common folk. He leaves no stone unturned to provide us with information about the baptism, marriage and burial of the many Żebbuġin who feature in his sumptuous publication. Being both an ecclesiastical historian and a researcher with a wide experience having even carried archival work on primary sources in different places all over Europe and beyond, Prof. Vella backs his text with ample references and the endnotes at the end of his long historical introduction speak for themselves. Prof. Vella also read the late Mgr Andrea Vella’s Iż-Żebbuġ u l-Ġrajja Tiegħu (1960s) as well as Rev. Joseph Vella’s Iż-Żebbuġ. Ir-Raħal ta’ Santa Marija (1989). An index at the end of a book makes it easier to access and renders the publication richer. Prof. Vella’s publication contains a detailed index; it must have taken the author a great length of time to work out the index with references to the names of the various people named and the pages on which they feature. The appendices at the end of the book provide us with the texts of the various pastoral visits that the bishops of Malta and Gozo made on the island which until 1864 was still part of the archdiocese of Malta. I would argue that appendix 35 is unique in the fact that it enlists the many family nicknames of the village which are still extant unto this day up to the point that people refer to each other using them in their everyday communication. In Żebbuġ, nicknames carry an important role since the surname Cini is extremely common and it is only by nickname that one may be able to distinguish between one family and another. The nicknames are enlisted according to the streets where the people carrying the particular nickname reside. A copy of the book can be obtained from the Żebbuġ local council in Gozo.